Have no fear, here are some solutions to your woes! I have compiled a list of creative storage ideas that I use, and ones that I have heard from others. For every option, I have given a brief description and instructions, as well as the pros and cons of storing your scarves this way. Please add your own ideas and experiences in the comments section! If you’ve using drawers to store your tichels, try folding them so they all face upwards. This way you can see everything that you have, don’t have to dig, and are less likely to have to refold. Use the extra space in front of your scarves to store headbands, pretieds, caps, hats, volumizers etc. Pros – easy “installation” because most people already have drawer space. You can easily see everything that you have. It keeps scarves out of reach from babies, children, pets etc. Cons – your tichels are hidden away and can easily be forgotten when putting an outfit together. Wrinkles can happen if not folded well. 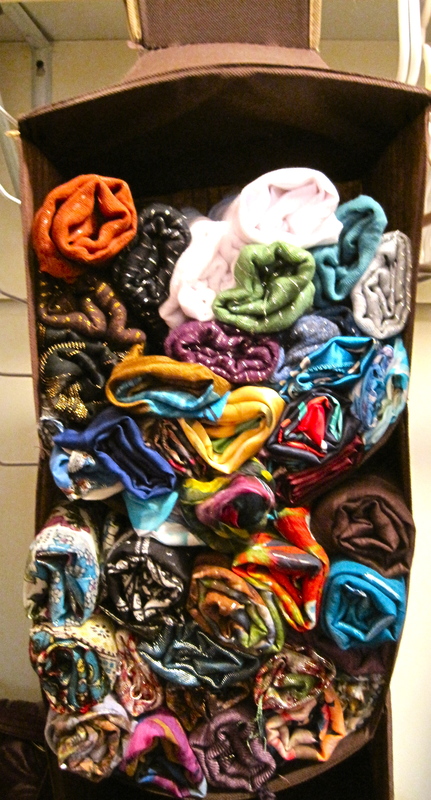 Scarves of different sizes can be difficult to fold in an organized manner. Your drawer can easily become disorganized. Hooks that are installed into the wall or hung on the back of a door are a great option for storing tichels. Make sure you choose hooks that are spaced closely together, for optimal storage capacity. Make sure that the hooks are able to bear the weight of the scarves, and are high enough to let the tichels hang down. Pros – easy access. You can see everything that you have. Looks beautiful. Can be done almost anywhere. Keeps scarves wrinkle free. Cons – you can’t “stack up” your scarves one under the other. Not compact. You need the wall/door space. Here is an amazing trick I came up with for storing clips and pins (edit: just found another person that does this as well… great idea!) Take a thick ribbon and tack/nail/hook it to a wall. I personally like doubling up the ribbon and tying a knot at the top because it looks prettier and is easier to remove. Then clip and pin in your accessories down the length of the ribbon. Pros – takes up very little room. Looks beautiful. Allows you to see what you have. Easy access. You can hang your scarves in you closet using coat hangers. Make sure you use strong coat hangers for heavier scarves, and velvet lined ones for slippery ones. 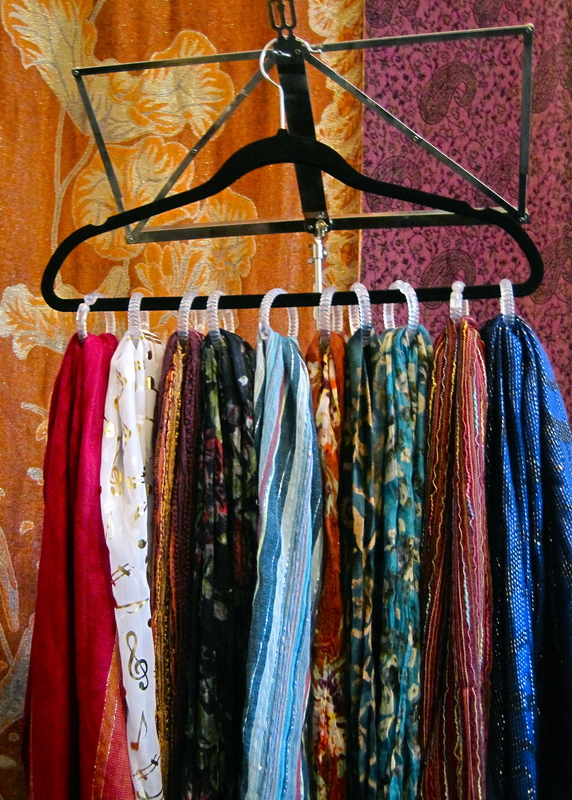 Hang your scarves like you would pants, and fill each coat hanger with as many as you want. Pros – super easy, requires no installation of anything. Good view-ability. Compact. Keeps scarves wrinkle free. Cons – takes up room on your clothes rack. Harder to see the scarves at the back. This trick can be done in any open shelf, or those hanging shelves that many put in their closets. Take your scarf, fold it into a manageable rectangle, and roll it up! The size of your roll will depend on how deep the shelves are. Keep doing this with all of your scarves and you have a beautiful storage option. Pros – looks beautiful. Very compact. Easy access. Keeps scarves wrinkle free. Cons – Takes a bit of time to organize on your first try. Sometimes hard to see the scarf because so little of the cloth is showing. A very useful tichel storage tool is a shower curtain rod placed strategically in a room/closet. The rod can be placed between windows, a wall and a bookcase, the back wall of a closet, etc. Make sure that you measure the space you intend to place the rod before buying one, because shower curtain rods come in different sizes. Also make sure that there is enough room behind the rod for looping your scarves over it. Pros – beautiful and easy. Your tichels are gorgeously displayed, so this can even be placed in a more public area. You can see everything that you have and organization isn’t a problem. 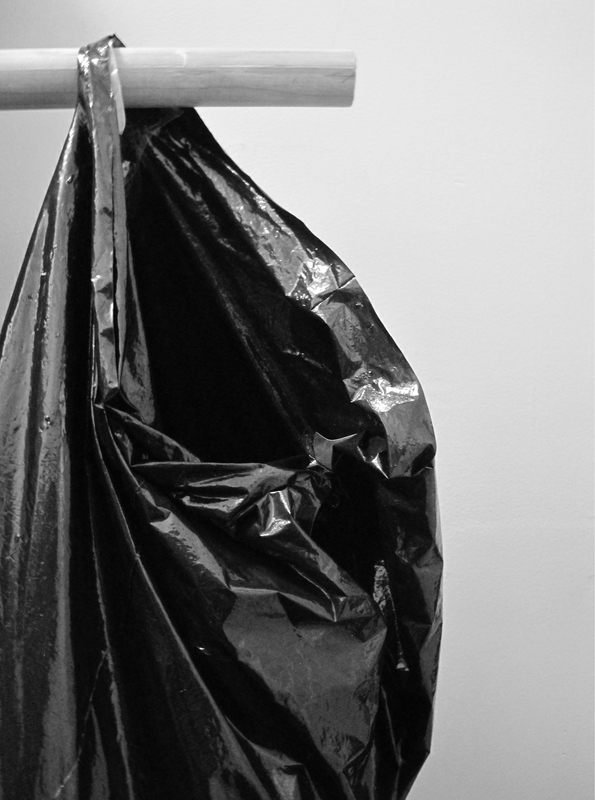 Cons – you need the space to put the shower curtain rod, which many closets/rooms don’t have. Try using a small trunk to store your headbands and other accessories. You can get these in many sizes, depending on what you would like to store. You can also use them for your tichels! Pros – so many box options! Can be hidden or out in the open. Cons – easy to forget about. Can become disorganized. …. and here are even more ideas! Try using a shoe rack to hang/store your tichels. I have heard amazing things about this! I know lots of ladies that plop all their tichels in a laundry basket, all loose and unfolded. It may sound disorganized and hectic to some, but it makes it easy to search around for things, and is obviously a big time saver in terms of folding/hanging. If it works for coats, why not for tichels? Take an old coat rack and transform it into a beautiful display for your head coverings. This works for storing your hats and pretieds as well. Thank you Caroline for this creative suggestion! Try taking a (strong) coat hanger and looping shower curtain rings around it. Apparently IKEA also sells their own version of this, but you can easily DIY. Use the rings to store your scarves for easy access and storage. I just tried this so here is a photo of how it’s done (just ignore the music stand). Ariella tacked a rope up on the overhanging lip of her bureau… now THAT is inventive! Try it on an armoire or any other furniture that you have with an overhanging area. Thank you Molly for this idea! 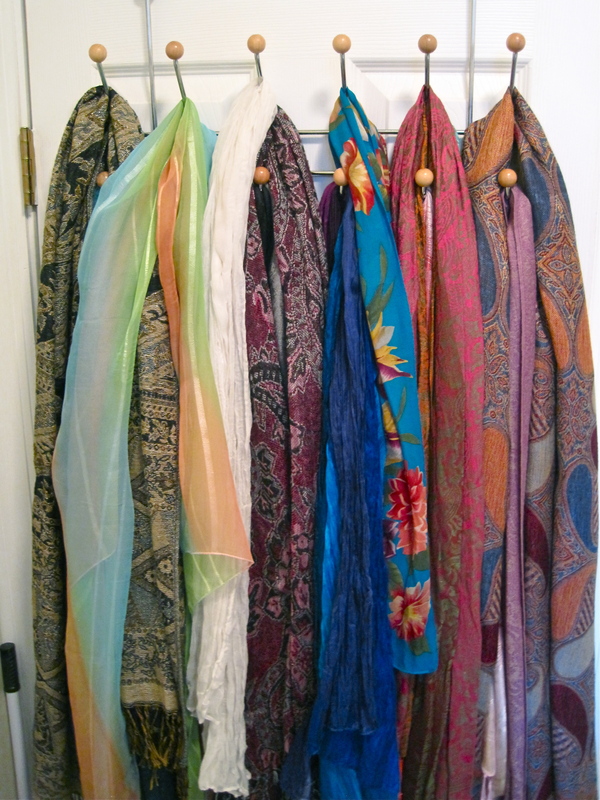 Try using a see-through hanging shoe organizer on the back of your closet door(s) to organize your scarves. This is a great way to keep everything compact and organized while allowing you to see what you have. How do you store your scarves? What works and what doesn’t? Tell us about your struggles and your solutions. These are the ideas that I have tried and have been suggested so far, but we are always looking for even more ways to store our tichels. Let’s help each other! What have you tried that is missing from this list? I know there are many very creative people on this site so let’s work together and come up with new ideas to help each other cover our hair with beauty and ease! I’ve been looking for storage solutions for my scarves for a while, so thanks for this post. I store my scarves in a big plastic bin, all loose and disorganized, but I’m familiar enough with my scarves to know which one I’m looking for most of the time. I think I’ll try the over-the-door hook and see if that makes it more organized. QUESTION: How do you clean your tichels, and how often? I usually wear a boubou/volumizer under my tichels (ever since I cut my super long hair), so I usually just wash those instead of the tichels. However, when I do wash them (used to be much more often before when they were directly on my head), I treat them all individually. Strong, durable ones go in the wash with my other clothes. Ones that may shrink go in cold water. Delicate ones are hand-washed and drip-dried. Colours that may bleed are either washed individually or with like colours. Some ladies might disagree with me, but I think that unless you are sweating profusely, you don’t need to wash your tichels that often. This also helps them last longer! I am new to this. Where would I get a volumizer/bonbon or make one, and how? Ikea has this hanger-type of thing with circles, i use that for putting my scarves on. hanging in front of me. I organise them according to size and weight. I usually have 2-4 scarves per hole. I use one for my sashes. Love it. I got a multiple-skirt hanger and all the clips came off. The hanger now holds many scarves, (at least) one over each half of the bar. By the way, you can remove the clips yourself; no need to wait for them to break off! tacked a rope to two ends of my dresser which has a little hanging lip over the top and have all my long scarves in there, with a basket underneath for regular triangles and another basket for pretieds and hats in my closet. baby loves to play with basket but at least I always know where they are, small wicker drawer set on top of my dresser is where I store hair clips, just clip them into the weave(pretty ones so it looks like decoration), in the drawers are my cheap wigs and hanging off the side is my fancy wig, and a huge coffee mug holds hair ties and bobby pins 🙂 everyones gotta do what they can with the space they’ve got! Hi there. I just clicked over from In the Married Lane’s FB post linking this page. What an interesting blog. I wear mostly pre-tieds and they are jumbled in an extra drawer. Now & then I will spot one in the back that I’d forgotten about–happy surprise–but mostly this works well for me. Andrea, what do you wear on your head when you run? I started running 2 years ago, and I’m still trying to work out apparel challenges. 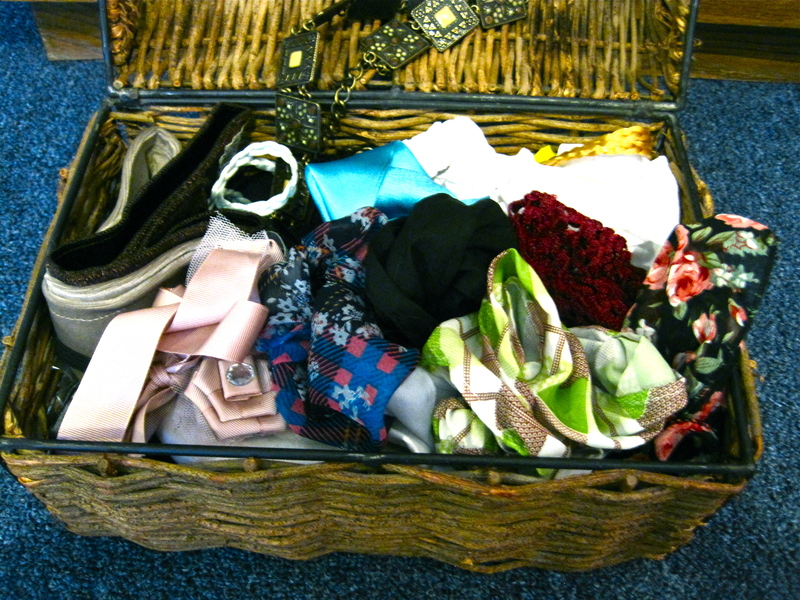 I keep my scarves in an old milk crate, loose and free and jumbled. It’s far from organized, but I know what I have. I keep accessories in a couple of little boxes on top of my bureau. I also use a laundry basket to store my pretieds/hats… whatever works! Thank you so much and I’m so glad that you found the site! Oooo that sounds great! Can you take a picture? This is great! Thank you. You are so right – you gotta maximize space and work with what you have! I have multiple spots. Embarrassingly, most are in a pile in a corner of my bedroom! Some I have on over-the-door hooks. I acutally prefer this way, it is much nicer looking and easier to find things. At my last apartment, I acutally bought wall hooks – not individual ones, but similar to ones that hang over the door. I had two lined up and all of my scarves hung there like a wall tapestry! That is so similar to what I do! So much easier to find things! I haven’t tried this, but it is a thought…. you know the automatic tie organizers for men that spin? Would that not be the perfect thing for a closet?! I use a sheet of metal powdercoated garden lattice that I attached vertically to the side of one of the bookshelves in my room. The openings in the lattice are about 3″x3″. I “thread” the longer scarves through the openings toward the bottom of the lattice and the shorter ones toward the top, so the tails are visible for all of them. I’ve been storing them this way for about four years now and have been very satisfied with the solution. The only exception is unusually bulky scarves, which go folded on top of the bookshelf. My 3.5 year old daughter Zoe helped me organise my scarves into boxes according to colour. I had to run out and hang out the washing and when I came back, to my amazement she had sorted ALL of them into the correct box. She didn’t want to let go of the pink ones though! I attached lengths of wire horizontally, each about three inches above the next, to the side of my armoire with finishing nails. Before I twisted the second end of the wire around the second nail, I ran it through the eyes (fulcrums) of a couple handfuls of clothespins. This made it so that the side of my armoire was covered with clothes pins that could slide left and right on the wire. Advantages: side of armoire looks gorgeous with those scarves, everything is easy to see at a glance, sliding of clothes pins makes for more room for thicker scarves when necessary, easy on easy off (if it’s not easy, I won’t do it), scarves clothes and mirror are in the same location and all visable at the same time for easy coordination, no wrinkles, storage space created where none existed before. Disadvantages: if heavy scarves are hung on a tight clothespin in the same spot too long, they stretch in that location. To avoid this, hang scarves by their tips rather than their center. I keep folded in a box, but the coat hanger with shower rings sounds fantastic! To iron delicate fabrics, use iron over a damp tea towel. By placing the damp towel on top of the fabric you wish to iron, the iron never touches the fabric directly and the steam helps to release the wrinkle. I have scarves and worship flags that I like to display. I use a wooden accordion style with wooden pegs that some people use for coffee mug holders. My husband has found several of these at thrift stores for next to nothing. I’m not sure they make them anymore. I tied a ribbon around one of the doors of my free standing closet, and I hang all of my ribbons on that as if it were a hanger or curtain rod. The ribbon sits above the hinge and is flat enough that it doesn’t affect the door being able to close. I usually fold and stack my mitpachot, but if I wanted I could tie ribbons on other closet doors and hang my mitpachot on them. This method could also work as a place to store clips and bobby pins. I only hang things on the inside of my closet doors, but theoretically one could hang things inside and outside to double the hanging space. The best part is that my husband saw my closet ribbon and decided to do the same thing on his closet door to store his ties! All my scarves, cloth headbands, etc. are in a basket on a shelf in my closet. I may try rolling them up to make the basket a bit more organized, but I love the shower ring idea! I draped an old fabric lanyard (the kind used to hold an ID) over the corner of the mirror on my dresser with a large river rock I found on top of it to hold it in place. I clip all my flowers on it. Brooches I store in the hanging jewelry organizer in my closet along with necklaces, earrings, etc. I found at a 3-drawer, clear plastic organizer (Sterilite brand) at Target. I originally bought two and stacked one set on top of the other. 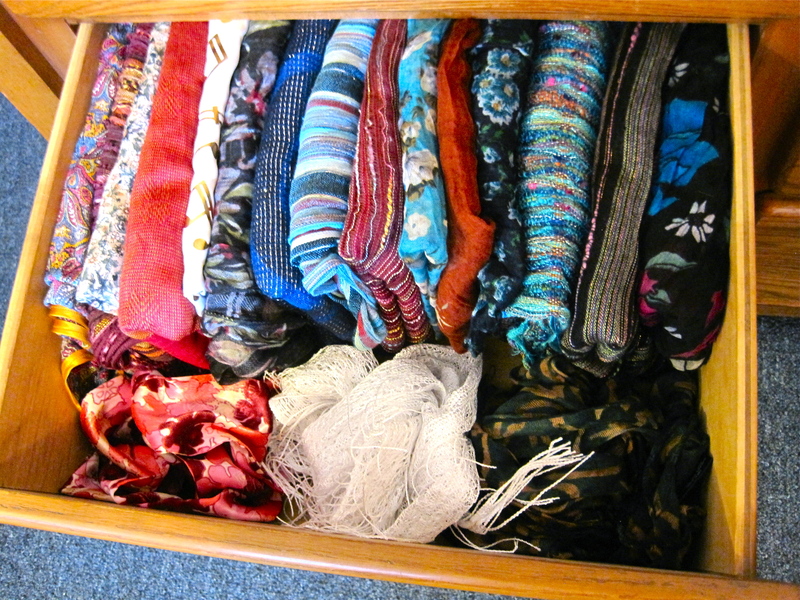 I organized the drawer by type or color of scarf. It worked great, but as I got more scarves, the drawers became a little too crowded, so I just bought two more today and set it up the same way. I turned mine over to my bureau as I live in a tiny apartment and first folded, then rolled them. My husband bought me 3 “scarf trees” with about 15 holes for the scarves each. I packed away all my summer scarves and have 75% of the winter ones hanging. Now I have 3/4 of my bureau back for skirts and pants and 1/4 with tichels I like best. I have no room for anything else; when summer comes I’ll do a switch and then see what I see. I’ll keep the squares in the bureau. This teaches me how excessive my scarves are. Beautiful, but I don’t need them all for sure and don’t even wear them, just look at them! So I’ve come up with a variation on the curtain ring and coat hanger idea; except you use a wire coat hanger and clothes pegs. Much easier than threading the scarf through a ring and having to iron it because of where it bunched, or worse yet having larger scarves that don’t fit the rings. You open the wire coat hanger, thread some pegs on the hanger, about 8. You then put the hanger back together, bend the bottom wire up in the middle. make sure there is an even number of pegs on each side. Fold Tichels in half longways then in half short ways until not very wide, and clip them on. This works great with scarves of all shapes and sizes and simply sits in the closet, using the same space as a pair of pants. Beware though, any more than 8 large Tichels and the coat hanger may not be able to hold the weight. I store mine in Sterilite flip-top containers, so they will fit nicely on a closet shelf and keep dust off them. I’ll take a picture when I’m done gutting and remodeling my bedroom in the distant future, but the pictures other people take on Amazon with their things in them gives a good idea of how it looks. I just fold them in there nicely and put them away (usually) at the end of the day. I use the coat hanger system but I group by color family…blues, reds, yellows/0ranges, black/white, etc. And one hanger for sparkly. When in a hurry, you only have to pul one hanger. I use the Chrome 5-Tier Swing-Arm Trouser Hangers (available at Walmart, Target, Bed Bath and Beyond, Dollar General, etc.). 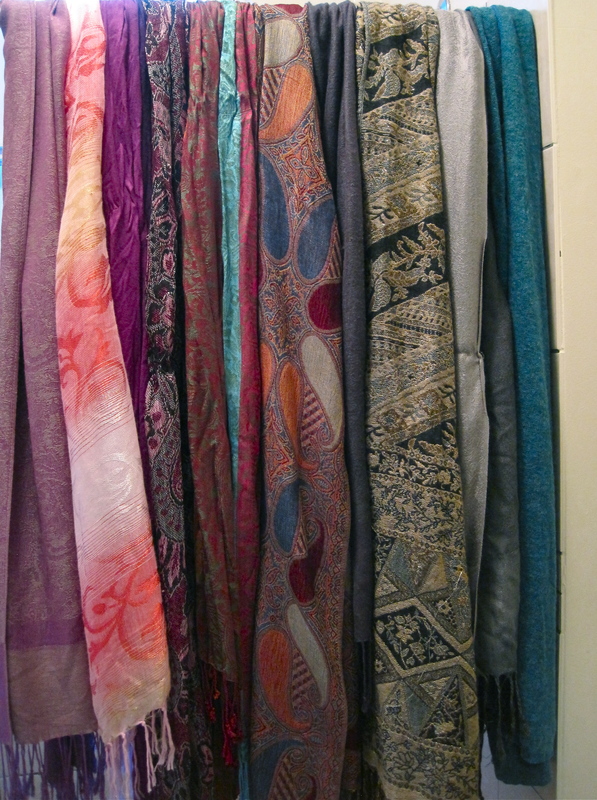 I have three of them that house solid, patterned and textured scarves. I also use more of these hangers for my bangles. One thing to note about shoe racks is that some are flimsy (ask me how I know!). To correct for this, get strong ribbon or nylon cord, start by measuring a 2 ft length, then a 3 ft length, and so on, and thread the bars onto the rope. Make the ends even, and thread each side through the door hook, then knot them. This will keep the cords from slipping out. Once both sides are knotted hang the whole thing on the door before adding the scarves. If the bars are textured? Just cover them with some rags before you hang up your scarves! All great ideas but I like to be able to see and organize all my scarves. I organize by type , not colors. All my NYB’s together, all my Shimmery’s togetherness, all my Shinylicious together, etc. I ended up hanging curtain rods on an empty walk in three layers. I don’t have too much wall space so I don’t know what my next step will be as I know I will be adding more scarves. I could never store them in a chest or in drawers because I love looking at them when I am planning what to wear each day. How do i post pics of my storage solutions? I keep mine rolled, in a shoe organizer hanging on the back fo the door. Very neat and tidy, I can see all of them. As my collection grows it might be a bit harder… but for nlnow it works really well. I have shelves in my closet and I have them folded on them. To clean my volumizer I place it in a lingerie bag. To clean my tichel, I spray them with Downey Winkle Release, which deodorizes them and then I use a steamer. I use the 4 arm towel racks that I got at ikea. I have 4 of them behind my bedroom door. they hold tons of scarves! I have my sashes on ikea’s macramé scarf hanger. it hold about 28-32. I still think my system is THE best … for me at least because I have tons on scarves. I have a nice storage shelf in my closet. So I fold them and stack them neatly with coordinating colors.